Everything you need to know about how to play and win the Free Lottery! Here is our step-by-step guide on how to set up your account, enter Daily and Weekly draws, check your tickets and claim your prize. Click on any of the icons below to find out more! 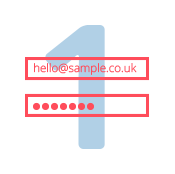 When you sign up to the site, you'll be asked for personal details like your name and email address. You'll also get to pick a personal password to keep your account secure. Once you've filled in these details and agreed to the terms and conditions, you will receive a confirmation email. Simply click the verification link and you're ready to play! Free-Lottery.net is completely dedicated to providing a fair system as well as a free system. Telling us your name and email address ensures that each participant only has one account and everyone has an equal chance of winning either the £500 Daily Draw prize or the £10,000 prize offered in the Weekly Draw. Sign up Today - it's completely FREE! Playing the Daily and Weekly Draws couldn't be easier. After you've fully registered your account, you can start right away. Just pick six numbers from 1 to 75 or use the Quick Pick option to have them randomly generated for you. A ticket will then be created for you and securely stored in your account. That's it! 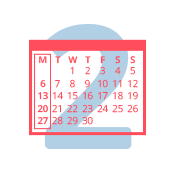 On signing up, you'll automatically get the chance to play in the next available Weekly Draw, after that you just need to play the Daily Draw at least three times in a calendar week to qualify for the Weekly Draw again. This means that you could win £500 every day whilst playing towards the £10,000 top prize! Entries into the Weekly Draw must be made before 12:00 UTC each Monday and Daily Draw entries close at 17:30 UTC on every other day of the week. Once a draw is complete, you simply check the results for yourself by logging into your account. Your homepage will show your latest tickets alongside the winning numbers and automatically tells you how many numbers you've matched! Alternatively, you can also visit the Latest Results page. We know most people don't want to constantly receive emails from a company, so Free-Lottery.net will not contact you about Daily or Weekly Draw results. You are free to access your account and check your tickets whenever it suits you. Forgot to check your ticket last week? No Problem! Registered users can access results for all Daily and Weekly Draws that have ever taken place. Simply log in and visit the Results Archive page. Results for the Weekly Draw go live at 14:00 UTC on a Monday and Daily Draw results are accessible from 19:30 UCT each night throughout the rest of the week. If you've checked the results and matched all six numbers drawn, then congratulations - You're a Free Lottery jackpot winner! Contact Us within 2 days to start the claims process. 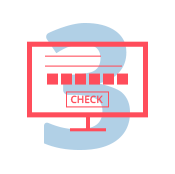 Once your numbers are verified, your winnings will be sent via recorded post to your registered address. Free-Lottery.net do not take any commission, so you will always receive your winnings in full. All prizes are guaranteed and underwritten by a leading insurance company. 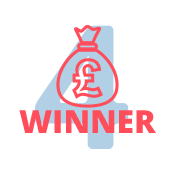 Matching all 6 numbers in the Daily Draw earns you a £500 prize, for a Weekly Draw win this prize fund increases to an incredible £10,000*! Visit the Frequently Asked Questions or the Rules page to learn more about what Free-Lottery.net has to offer. *If no one matches all six numbers in a Daily Draw or Weekly Draw, no prize will be awarded for that draw. See Terms & Condtions for the full Free Lottery rules.